Hi everyone! Happy Thanksgiving! I hope today finds you and your loved ones well. 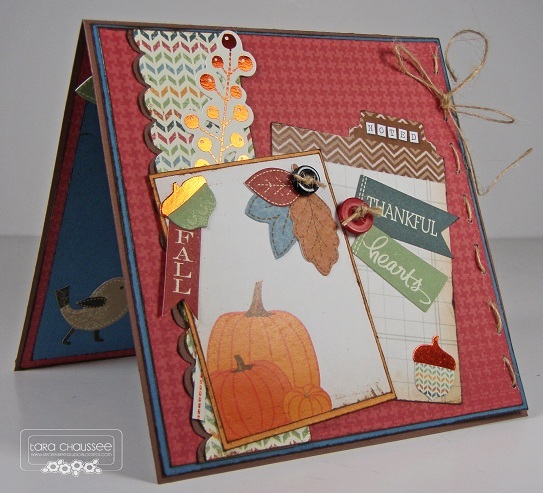 Today I have a little post about a simply sweet Thanksgiving card. I started with Raisin Boat cardstock in Autumn shades of brown, blue and red and layered those with the adorable 'Acorn Hollow' paper and coordinating sticker sheet from Little Yellow Bicycle . This line has the cutest Fall images- lots of sweet little forest animals, trees, leaves and flowers. I added a couple of charming tags from Chic Tags in the background and a few vintage buttons from my stash with just a bit of twine for a rustic look. The inside is clean and simple with a few more 'Acorn Hollow' accents and a simply sweet sentiment for the holiday. I will be having lots of thankful thoughts today as I am surrounded by the people that make me the happiest and very dear thoughts about the ones that are far away but are still sharing the day with me in my heart.